The Cure for "Mac Envy"
After almost ten years, I've finally found the cure for Mac envy: buy a Mac. My first computer was a 286-powered PC clone. It was a hand me down from my father, who was upgrading to a 25 MHz 486. I had no real need for a computer at the time, but Dad really wanted me to get with the times - and I didn't want to disappoint him - and besides, it was free. So I took the computer, and it wasn't long before I was hooked. I learned a lot from that old clunker, not the least of which is that it's a waste of money to try to upgrade a 286 to run Windows. This was around 1991 or so, and Windows 3.1 was the big thing in the PC world. As I learned about operating systems (and "operating environments," as Windows was called back then), I kept hearing that Windows was "just as good as a Mac". In fact, I heard Macs mentioned so often that I decided I should find out just what it was about them that was so worth emulating. Well, it didn't take more than a glance to see that the Macintosh was by far the better machine. Just the user interface was light years ahead of Windows at the time, and I was still using plain old DOS. I instantly contracted a case of Mac envy, which persisted until just recently. Unfortunately, along with the ache of Mac envy, I also experienced the pain of sticker shock. It seemed like they all cost 4 or 5 grand - way out of my price range. So I plodded along with my 286, replacing it in late 1993 with a 486 that I got a bargain on because the Pentiums were shipping. I used that computer, with a few key upgrades, up until about a month ago! For nine years I used PCs. I ran my business on one, fixed other people's machines, even set up a network in my sister's vet clinic (only two computers and a hub). During all this time, I knew deep down that I wanted a Macintosh, though I couldn't quite put my finger on why. After all, I was happy with Windows. I found Win95 to be a very satisfactory interface, and I was comfortable with it. It was always rock solid on my machine. But it lacked something. It always felt clunky, patched together. The Mac OS has an elegance that can't be described, has to be experienced. Then in 1998 the iMac appeared. Even here in the wilds of Upper Michigan, in a TV-less household, I heard about the iMac. My Mac envy had been under control for several years, but this threw me into a raging relapse. I began reading Mac magazines and searching for Mac related web sites. One of the first ones I found, and by far the most informative, was Low End Mac. 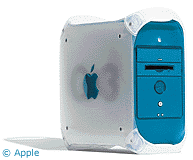 I pored over the specs for older Macs, figuring I'd buy something two or three generations old. LEM's enthusiasm for the SE/30 was contagious, so since my #2 son wanted a computer in his room for school work, I picked up an SE/30 and an ImageWriter on eBay. It fits nicely on his small desk and suits his needs well. But although I played with that Mac a bit, it still wasn't my Mac. This time around, though, I knew I was going to finally get one. Prices were realistic - even cheap -- and there were several generations of usable older Macs that could be kept usable with upgrades. My wife even allowed as how we did need a new computer, and she generously approved a budget of $63. But by holding a virtual garage sale on eBay, I rather surprisingly found myself with enough money to buy a B&W G3/300! I finally had my Mac, and a lot more Mac than I ever imagined I'd have. What a sweet machine! I've already beefed up the memory, and of course I had to buy a new printer and scanner, since none of my old stuff would work. VirtualPC was also a must, since I have a couple of Windows-only programs that I need. I have spent a few bucks on this thing, but now I'm ready to stop buying things and start using this great machine. Photography is one of my hobbies, so I'm anxious to see whether the digital darkroom will replace my wet darkroom. I'm also looking forward to playing around with a bit of video editing. I'm happy to report that my Mac envy is now completely cured, and although I'm just beginning my Macintosh journey, I feel the same way I do when I'm standing on my snow board at the top of a nice powder run: I'm gonna enjoy this ride.